The area of desert south-east of Cairo is one of the least-known spots on earth. Facing the Red Sea on the east, and stretching into the vast Sahara on its Western flank, the Organisation spent several days here seeking out one of the hidden spots of Egypt for the World Cup Rally to explore. Snake Valley near Hurghada twists and turns through soft gravel and sand for a short distance then opens out across a plain – you head for the cutting between two black cliffs, the entrance to an enchanting valley. Low lying bushes, the odd Acacia tree and a maze of tracks that criss-cross themselves into knots of trenches and paths… the trick is to use our basic notes with distances whirring away on your trip-meter and find the right route, foot down. Timed to the second, you spend most of the morning working your way westward, and then turn south. Emerging from all this was the Belgian Porsche 911 of Joost Van Cauwenberge &amp; Jacques Castelein who set fastest time, dropping just 8 seconds, Steve Blunt and Bob Duck in the non-turbo black Subaru Impreza was nearly two minutes behind on 2m05s, and third best was the BMW M535i enjoying a good run, nearly four minutes behind the time set by the 911, but a good effort for Renger Gulliker and Pim 't Hart. Andy Actman’s Toyota Truck was fifth, just under four minutes adrift, behind the fourth-best Rene Declercq and Francis Tuthill, who stopped to pull out the Maestro girls at one point. Andy Actman had also stopped to pull out a stuck car – the MG ZR of Owen Turner. Owen and Matt lost their lead which they had held from the outset today. Defeated in Snake Valley, they took a tumble down the points league to 4th overall. The Maestro Girls of Jane Edgington and Gill Cotton retain 5th spot, having got stuck several times. Their good ground clearance, and fairly smooth Falken van tyres, came in really useful in the soft conditions. 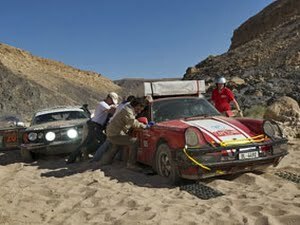 Crews are at a comfortable hotel for a meal and a few hours break, at midnight we leave for the port and the crossing of the Red Sea to Saudi Arabia – another first for this event, the Kingdom of Saudi Arabia has never before ever hosted an international rally crossing its territory.